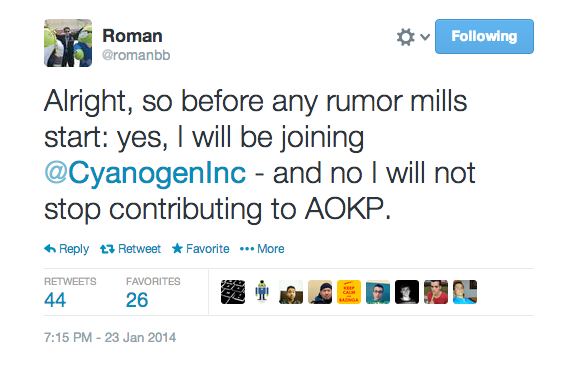 Last night on Twitter, it was made official that AOKP’s main face Roman Birg, was departing his current “roll” and taking up a new position within Cyanogen Inc. in Seattle. We have talked with Roman in the past during a Tato Series interview, and you can tell that he is a bright mind, which is a good fit for the CM crew. The exact nature of his new roll within CM is still unclear, but we can assume it has something to do with the development of features within the ROM itself. Whatever it may be, we wish him luck. As for fans of AOKP, don’t worry, it’s not going anywhere. The ROM and its community is still alive and well, with Roman making it clear that he will not stop contributing to AOKP. In the long run, that could be great, given that he could bring back newly-learned knowledge and apply it to the ROM. Big cheers to Roman from us here at DL and best of luck in Seattle.